Hold on. No. That's not right. Let me restart. 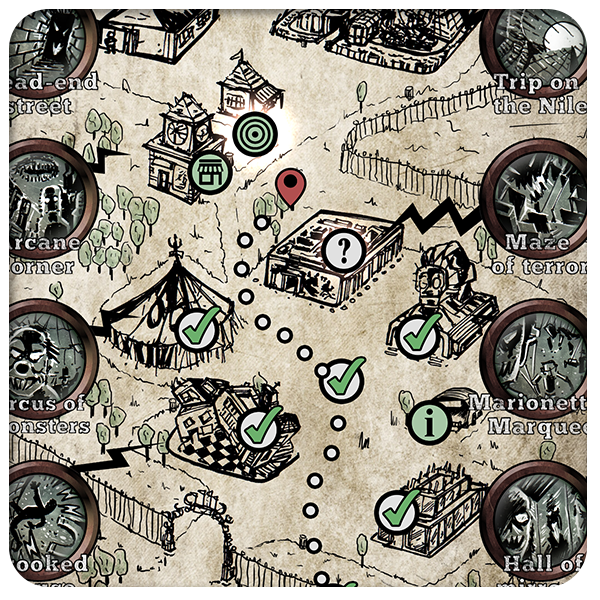 This is my review for The Sinister Fairground, the iOS gamebook app released in May by Barcelona-based Cubus Games. Here's my short review: The game is great. If you own an iOS device, or if you have occasional access to one, buy it. Here comes my longer review. In The Sinister Fairground you take the role of a young man who unwisely chooses to meet his girlfriend Sophia in the diabolical Fairground of the Extraordinary. You quickly realise that the fairground's dastardly denizens have stolen Sophia away, and that you'll have to search through an array of macabre attractions if you ever hope to see her again. 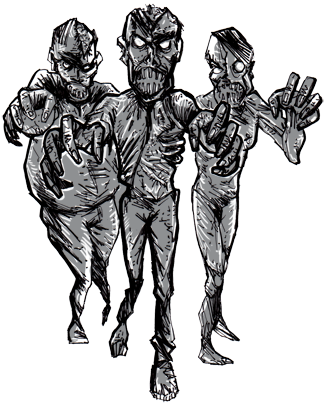 It's grisly, horror-themed hi-jinks - though you'll also come across a fair amount of self-conscious, genre-savvy comedy as the game pokes good-natured fun at various horror and fantasy tropes, and even the medium of gamebooks themselves. There's a lot of good stuff here. The in-game map features 11 main areas to explore - such as the 'Circus of Monsters' or the 'Hall of Mirrors' - and a handful of other mini-areas besides. And there's a ton of content in each one. You won't see everything in a single playthrough. Some encounters and enemies are played for laughs. Others are genuinely eerie. Personally, my most chilling in-game experience so far has been sharing a car with a Portuguese serial killer - though, curiously, this Dexter-esque foe didn't try to harm me in any way (on this particular playthrough, at least - I'm sure I could have easily attracted his ire if I'd been more careless). Each area is essentially independent of the others, though there's some crossover in the clues and items you can pick up that can prove useful elsewhere. You also get a few Easter eggs sprinkled about the game (one of them even gives a shout out to fellow gamebook app developers Tin Man and Inkle). Cubus has developed a lovely game engine. It's pretty, and it's easy to use. I'm not a huge fan of virtual dice rolling around the screen of your device (Grr...), and a lot of dice-rolling - or rather, dice-spinning - does take place here. But that's not so frustrating, as the game allows you to amass 'Hero Points' that can be used to reroll or even automatically pass failed tests. Similarly, combat is dependent on rolling to hit your enemy (Grr...), and rolling to see if your enemy hits you (Grr...) - but there is also a tactical element, in that you have to choose which weapon to use (Chainsaw? Katana? Magnum 44?) and whether you want to use various one-off items or spells to help you, from round to round. And, best of all, IF YOU GET KILLED YOU DON'T HAVE TO START AGAIN FROM THE BEGINNING. I love this feature. Instead, the game boots you out of the current area, and pretends that the last few encounters never took place. Brilliant. It's so much more fun to play when you don't have that ever-present risk of total failure hanging over you. Another great feature - you can use your Hero Points to automatically beat any really nasty enemies. Even big, plot-important foes. It's a sort of 'cheat-if-you-want-to-without-feeling-bad-about-it' mechanism, and it's inspired. The story is sometimes flimsy. For instance, you never get much information about Sophia, your girlfriend. Why do you like her? How did the two of you meet? What sort of personality does she have? I'm disappointed there's no option to play as a girl, or as a gay or bisexual character. I know that coding a lot of different variables like this takes more work, but I'd have liked to see something a little more progressive. In the English-language version of the game, there are occasional proofreading problems - typos, misused words, clumsy-sounding sentences. But none of this is serious. It doesn't disrupt the flow of the game. A personal bugbear: I dislike inventory management. Yes, it's more realistic and it increases the game's challenge. I just find it a pain in the backside. Here, you're limited to carrying five weapons and ten objects. So, overall verdict: I refer you back to my short review above. The game is excellent. Cubus have really done well with this one, and I absolutely recommend it. At the time of writing, their second game - Heavy Metal Thunder, by Kyle B. Stiff - is due for imminent release. And I'm really looking forward to seeing what they do with it. Even though it might not have as many scary ghosts.